Golf Is Back On The New Yorker Cover! It's been a while since golf, which once received some attention at the New Yorker and no shortage of pages filled by Herbert Warren Wind's writing, has graced a cover. April, 2011 to be exact and it was a Bruce McCall piece depicting Tiger playing a recovery shot. Here is the explanation of the latest Barry Blitt cover featuring President Trump. Paul Harral explains in detail what UT's new Dan Jenkins Medal For Excellence in Sportswriting means and talks to His Ownself about the honor. Jenkins is known from here to Baja Oklahoma as one of the best sports journalists to ever grace the pages of a newspaper or a magazine and both fiction and non-fiction books. The event also exposed many of us non-Horns to the Stark Center, a stunning collection of sports memorablia and papers stored in a huge, impressive archive. Jenkins pledged during the evening to leave some of his papers at the same place Harvey Penick's Little Red Book is housed. Longtime golf writer and photographer Jim Moriarty has penned Playing Through (University of Nebraska Press), his look at the incredible thirty-or-so-year window that has seen massive change and the Tiger Woods influence. Best known for his revealing Golf World feature stories, Moriarty has used those pieces to weave together a nice overview of the game as it saw major changes. Other writers have put together anthologies, but Moriarty's style makes this one a little sexier than the usual anthology. If you want a signed copy and to support a great Pinehurst institution, you can buy the book here at the Old Sport Gallery page. Or, if you just need a good golf read or a smart gift, Amazon also has you covered with hardcover and Kindle editions. Jim kindly answered a few questions about the book and what he's seeing with Tiger, the state of golf media and the next generation of stars. GS: This is not an anthology, but a combination of new thoughts and essays on key players over the last thirty years. What made you go this route with the book instead of an anthology of previous Golf World and Digest features? JM: The concept was pretty simple, which is good because complex thinking isn’t in my wheelhouse. Two of Herb Wind’s books, The Story of American Golf and Following Through (the latter a compilation of his New Yorker stories) taken together do an admirable job of telling the story of golf in America from the Apple Tree Gang to right around Nicklaus/Watson at Pebble Beach. While I certainly don’t — in any way — put myself in Herb’s category, the idea was to more or less pick up where he left off. There are lots of terrific books about a player or a tournament but nothing that sort of covered the field sideline-to-sideline. Then the question was, do I take on the last 30 years chronologically or in essay form, and I chose the latter. GS: Tiger naturally gets a big chapter, what did you make of his most recent comeback? JM: Honestly, I'm thrilled. One of the essays in the book is called "Last Acts." The great champions all seem to get a curtain call, discounting Jones and Nelson, who just walked away. I’d love to see Tiger get his. It’s completely unclear whether the body will hold up. The truth is golfers are athletes like any other. A football player blows his knee out. A baseball pitcher loses his arm. Either you can go or you can’t. It’s very cruel. GS: You continually note the game changing at the hands of technology but insist the essence of elite golf has not been negatively altered. But do you think Tiger and perhaps Phil Mickelson have had their skill advantage dulled by the way equipment is more forgiving? JM: I think the USGA and the R&A have been guilty of malpractice when it comes to equipment regulation. Do you see them moving the fences back at Wrigley Field? Having said that, what makes Tiger Tiger or Phil Phil is that whatever-the-hell-it-is that allows one to hole a putt bouncing like a Ping Pong ball down the 18th green at Torrey Pines or the other to attack the 13th green at Augusta National out of the trees and off the pine straw. Rocco knew Tiger was going to make that putt because, well, that’s just what Tiger does. In a different time or place someone could have, would have, said the same thing about Jones or Hagen, Hogan or Nelson or Snead, Nicklaus or Watson. In that respect, I don’t think the game has changed one little bit. The message is in the bottle — British version — always has been, always will be. It’s the stuff TrackMan can’t measure that ultimately matters the most and they don’t pass it out in equal amounts. GS: Where do you see the current young generation of stars in a few years? Do you see shorter careers due to the money, increased visibility and stress compared to previous generations? JM: I don’t think great players give a damn about anything except beating other great players. And we’ve got some great young players. I hope I live long enough to see them kick the hell out of each other a lot. GS: Over the last thirty years, when was the game at its (A) best and (B) worst/lowest? JM: Every time I go to Pebble Beach, the first two things I do are 1) go to the spot where I was kneeling beside the 17th when Watson chipped in and 2) walk around Stillwater Cove to the spot above the 7th where I had probably my longest conversation with Herb Wind. Moments stick out. The ’86 Masters was pretty good. And Tiger at Torrey wasn’t half bad. Same with Payne at Pinehurst. Our’s is a game that sooner or later can’t help but rise to a level above our expectations. This is personal but, to me, the lowest point was the disgraceful way everyone behaved toward Casey Martin. For a long time the sport was looking for the Next Nicklaus. I'll bet we find the next Woods before we find the next Casey Martin. GS: Star you most enjoyed covering and star you least enjoyed covering? GS: You were a longtime photographer who transitioned to writing. Player profiles were a big part of your career, but now we are down to really only Sports Illustrated still doing deep dives into stars. Do you see this and the overall decline of golf media having any impact on how we enjoy the sport? JM: Actually, I was a longtime writer who got suckered into photography when I joined Golf World in ’79 as the associate editor. Taking pictures was part of the gig for the last guy on the masthead. As time went on my photographer friends thought I was a writer and my writer friends thought I was a photographer. So, I fooled everyone. And, yes, I’m absolutely gutted that there aren’t more places where writers get the time and space to do what what they do best. Geoff, you and I were both friends of the late, great Frank Hannigan. Remember the piece Frank wrote on A.W. Tillinghast for the old Golf Journal? It was staggeringly good. Where does that story go to be told today? Shockingly there is a golf pro willing to confess his love (and good use) of the written word. Even better than the idea a future Hall of Famer is searching so hard, is that Padraig Harrington credited the mental performance book after winning the European Tour's Portugal Masters on Sunday. What pleased him most about his win was his mental attitude and he credited coach Dave Alred with the turnaround having read his book, The Pressure Principle: Handle Stress, Harness Energy, and Perform When It Counts, earlier in the week. "I feel really good," Harrington said. "I was very relaxed all week. I was in a nice place mentally. "I've been reading Dave Alred's The Pressure Principle and it gave me a few pointers that maybe I'd been missing out on and I stuck to those all week. It was a big plus for me. "I just realised how poor my own language is about myself and my game. So I was very focused on my self-talk this week and what I was saying to myself and very focused on my posture walking around on the golf course and it was a tremendous help." Kevin Robbins has authored a biography of Harvey Penick due out April 5 (though Robbins will be signing exclusively Wednesday at the Austin CC pro shop). The former Austin American Statesman writer is still on top of the Austin golf scene and is a professor at the University of Texas School of Journalism. I've just begun his wonderful book and for fans of golf or biographies, it's just the kind of celebration of an American life that you could hope for. GS: What inspired you to do a biography of Harvey Penick? KR: My grandmother gave me the Little Red Book for Christmas in 1992. Every chapter felt like an epiphany. I’d never read anything like it. It completely changed the way I looked at golf. I circled words, underlined passages, dogeared pages, filled the margins with stars and check marks and exclamation points. I bought the three other books and loved them just as much. All these years later, after I’d written many times about Harvey and his family and his pupils as a golf writer for the Austin American-Statesman, I was lying in bed, trying to think of a book idea, because I was a college teacher now, and college teachers are expected to write books. I originally wanted tell the man-in-full story of the 1995 Masters. But Ben Crenshaw was tepid about the idea, and I really needed his participation for it to work. Literally the very next night, lying in bed again, I realized I was missing the point entirely. I didn’t want to write about the 1995 Masters. I wanted to write about the reason we remember the 1995 Masters. That reason was Harvey. GS: Most people know of Harvey through his book or Ben Crenshaw’s Masters win. What does the book delve into that will most surprise people about his life? KR: Many things, I hope. Harvey was an excellent player. He competed with or against Walter Hagen, Ben Hogan, Horton Smith, John Bredemus, Babe Didrikson Zaharias, Betsy Rawls and many other titans of the game. He played pre-PGA Tour professional tournaments throughout Texas, including the early Texas Opens at Brackenridge Park. He finished in the middle of the pack at the 1950 Texas PGA, notable because his prized student, a young man in cuffed khakis named Morris Williams Jr., beat Byron Nelson to win. Williams won the three major Texas championships that year — the Texas Junior, the Texas PGA and the Texas Amateur. He remains the only player to have done that. The book shines a light on players such as Williams, who died three years later, before he turned 24. He might have been the best player Harvey ever taught had he not been killed in a plane crash in Florida. I hope readers will enjoy learning about how young Harvey learned to play — by watching the greats, including first-hand encounters with Francis Ouimet and Bobby Jones — and how he turned those observations into the contents of his red notebook, the forebear of the Little Red. But I hope also readers will enjoy meeting and learning about players such as Williams, Ed White, Terry Jastrow, Cindy Figg-Currier and many others who never made the World Golf Hall of Fame but have compelling stories nonetheless. I also love the story behind the Little Red Book. On one level, it’s a story of the relationship between two unlikely collaborators: Harvey and his co-author, the larger-than-life Bud Shrake. On another, it’s a story of purpose. Harvey was not well in 1991, when he and Shrake began work on the Little Red Book. The project gave Harvey another reason to live. It gave him new meaning. This is a biography, but it’s also a story of the importance of identity. GS: You are teaching journalism at UT. What’s your sense of the state of golf journalism today? KR: I miss Herbert Warren Wind. I mean that both literally and figuratively. I very much admire Alan Shipnuck and Michael Bamberger and Karen Crouse and others who tell wonderful stories about and through golf, but I’m sentimental for the time when Golfweek and Golf World arrived in the mailbox with evocative, well-crafted game stories and profiles that I could really settle into, for when The New Yorker gave Wind 6,000 words to go deep and long and broad. Golf seems so well suited to literary journalism. Who was it who said the smaller the ball, the better the writing? He, or she, was right. I don’t follow golf journalism quite as much as I used to. I still read Doug Ferguson and will until his last tournament. I think Jason Sobel is delightful. I miss Bill Fields. I like what you, Shane Bacon, Shane Ryan and others have brought to golf coverage. You’re responsible for a shift, I think, to journalism that is less cloying, more critical, less reverential and more accountable, in the tradition of Gary Van Sickle and Jeff Rude. I also think Golf Channel is doing good work, both on the broadcast and the website. There are more places to go for golf coverage and commentary. Everyone seems to make everyone better. GS: The location where Harvey started as pro at Austin Country Club is not the current location, correct? What’s the backstory on the club’s move? KR: The club has moved twice. The growing city of Austin eventually surrounded the original location, so the club moved east — to the country, as it were — in 1950. Perry Maxwell designed the course there, and that’s where Harvey made his greatest impression, teaching players such as Rawls, Kathy Whitworth and Mickey Wright, as well as Crenshaw and Tom Kite when they were boys. The club moved in 1984 to its current location in Davenport Ranch, in the beautiful and prosperous hills of far west Austin. Another club, Onion Creek (the birthplace of the Champions Tour, it should be noted), had begun siphoning members in the 1970s, and ACC wanted to relocate to where the money was moving in Austin. That direction was west. 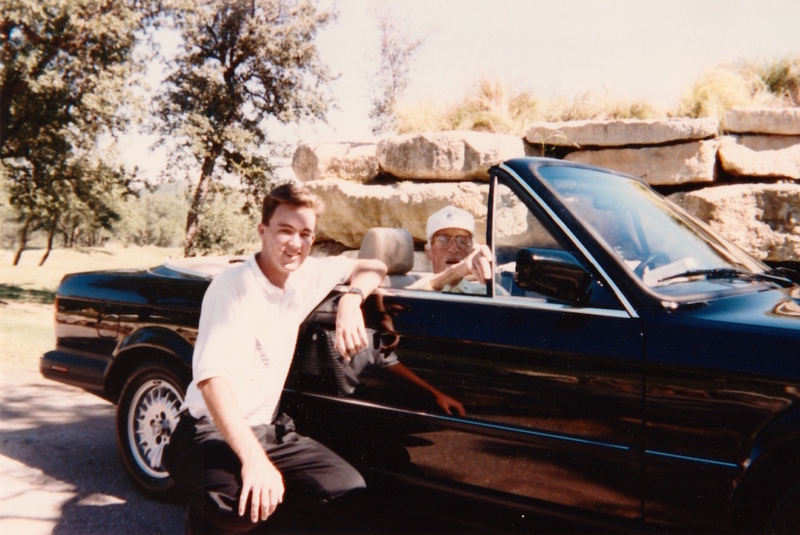 Your site host meeting Mr. Penick in 1990.GS: How do you think Austin CC will work as a tournament venue? KR: Great question. I've played ACC a number of times, but not until the 2012 Texas Mid-Amateur qualifier did I truly learn how to score on it. It isn’t a bomber’s golf course. You have to hit spots with tee shots — sometimes in order to avoid losing a ball in Lake Austin or in a canyon on what will play in the Dell as the front nine. It’s Texas, so you play in wind. It’s a spectacular second-shot course. I think it favors players who excel with wedges. It’s a short course, so even with fairway metals and long irons from the tee, these players will have many approaches of 120 yards or less. Three of the par-five holes, and maybe four (I don’t know which tee they’ll play on No. 16), are reachable, so little scrambling chips and pitches will be crucial. It will be cozy. The club isn’t easy to get to, or to walk. It’s bound in many places by the lake, the canyons or, to a lesser extent, neighborhoods houses mansions. It’s not roomy like, say, an Oakmont or Augusta National. Think Colonial, only up-and-down like Augusta — with less space for spectators. GS: What’s your sense on the outcome of the Lyons muni situation? KR: The lease between the city and the University of Texas Board of Regents expires in 2019. A wonderful group called Save Muny has made a lot of noble progress in advancing Lions’ rightful role in desegregation, but I don’t think that will have any consequence on system’s goal to extract more money out of that incredibly valuable land. I’m already preparing my farewell letter to sweet Lions. GS: Favorite TexMex spot in Austin? KR: Trap question. Mine is Matt’s El Rancho, with about 33 other places in a close tie for second. GS: What’s the community interest level in this event? KR: High. Folks are beyond excited. They want to see Jason Day and Adam Scott and Rory McIlroy and Jordan Spieth and Phil Mickelson. They also want to see what ACC looks like beyond the lakeside holes they see from the Pennybacker Bridge on Loop 360. You can’t see much of ACC from roads or streets. I know some very good players in Austin who’ve never been inside the gates. So I think part of the enthusiasm has to do with television coverage of the front side of the course (the back-nine holes every other week of the year). GS: Favorite golf course in Austin? KR: Another trap question. I have a rotation of four, and I often answer differently, depending on the occasion. If this were any other week of the year, I might say The Hills Country Club (designed by Jack Nicklaus, a shot-carver’s dogleggy dream, home of the long-lost Champions Tour event in Austin known as the FedEx Kinko’s Classic), the Onion Creek Club (designed by Jimmy Demaret, birthplace of the Champions Tour in 1978, the prettiest little cypress-lined course east of Houston) or Austin Golf Club (designed by Ben Crenshaw and Bill Coore, a quiet delight of walkable purity — it feels like a sanctuary to me -- tucked into the ranch land west of Austin). But it’s not any other week of the year, so my answer is this: ACC. From Kickstarter To The Herb Wind Book Award! In this week's Forward Press I make the case that the holiday gift book to buy this week and going forward is the Confidential Guide To Golf Courses by Tom Doak and friends. Yes, Stevie Williams' book is tempting and an easy download, but if you are looking for a serious holiday gift for a golfer, this is your safest and least sleezy option. I asked Doak some questions about the book for my GolfDigest.com review and his answers were so enjoyable that I feel required to give you them in their entirety. So here goes and remember, you can order individual copies or the entire Confidential Guide set here. Q: You have co-authors/contributors in the new series of Confidential Guides. Could you give us an idea how you decided on this approach? TD: There were two reasons. First, I wanted the book to be worldwide in scope, and there were so many good courses built in the last 20 years that I'd fallen behind in the percentage of them I'd seen. I felt I needed help with coverage if the book was going to be thorough. Second, my co-authors' ratings are an important counterpoint when I don't like a course. Negative opinions are always controversial, so it helps when you have other people either confirming that opinion, or softening my opinion when they disagree. Q: The reviews still seem very much in your voice, could you give us a sense of how this part of putting the reviews worked? TD: I started by sending my own draft reviews of each course I'd seen to the others, and letting them add their own comments on what I'd written, as well as writing their own thoughts on any courses I hadn't seen. But when I started putting the first draft together, it was very jarring to read a review by Darius or Masa in the midst of some of mine. [Plus Masa needs a bit of help writing in English, anyway.] After a while, I decided it would be a better read if I took everyone's input, but wrote the reviews in my own voice. The numbers at the bottom make it clear who's actually seen each course, and if there are real disagreements about the merits, I will note who thinks what. Q: This is volume two now, how has the reaction been to these latest volumes compared to your original Guide? TD: When the original edition appeared, there was both joy and shock from some readers, who couldn't believe I put such strong opinions in print. The reader reviews this time are more muted, because most readers are at least semi-familiar with the earlier version. There's a lot more focus on the smaller courses, because the big ones had all been rated before. The press reaction is pretty similar to before. For volume one, a lot of the press was focused on the one "zero" rating I gave [out of 288 reviews]. A couple of those articles didn't even recount what I'd actually written about the course -- just the number! -- and some tried to make it personal, even though I'm reviewing courses, and not architects. But it wasn't much different in 1996. GOLFWEEK's review of the last edition was all about the twelve courses that were rated a zero, including a long sidebar defending Desmond Muirhead's Stone Harbor design. In truth, golf writers tend to be among the book's biggest fans. They can quote me on a review they probably agree with, and let me take all the heat for it. If they thought the review was really unfair to a course they liked, they would never mention it. For instance, I noticed that when GOLF Magazine did their excerpts of volume 1, they edited out the negative bits of my reviews of Trump's Aberdeen course. Q: Have you encountered much resistance to visiting/studying/playing courses that fear a bad review? TD: A couple of my hosts have joked about it, but really, not at all. But I never just walk into a course and say I'm there to review it. And I only go to courses I'm interested in seeing; I don't go anywhere with the intention of writing a bad review. If I suspect I won't like a course -- say, the Trump course in Palos Verdes -- why bother? I will just go somewhere that interests me instead, like Lakeside, which I'd never seen until last year. However, if I go to see a course and I don't like it, I'm not going to pretend I wasn't there in order to duck the controversy. That would be dishonest. Q: On the Doak scale, how would you rate the state of golf course design as an art form when the first Confidential Guide was released versus now? TD: The state of the art is very high right now -- let's say an 8 today, versus a 6 twenty years ago. There are a ton of talented young people in this business today, working on construction crews for us and for other big firms; our internship program has helped give some of them a foothold. The only thing missing is opportunity. You only see real divergences from the design style that's in vogue during boom periods, when designers are more likely to go out on a limb to attract attention. There are so few new courses to build that developers are more cautious than ever. They're less likely to take a risk on a young designer when the big names aren't too busy to talk to them. Q: The books come as beautifully produced self-punished hardcovers. Why approach it this way as opposed to a subscription website or e-book? TD: I love books. And I understand the economics of the book business a lot better than those other forms. It's possible that at some point down the road I will put my reviews into some form of subscription web site, although my collaborators might have their own designs on that. But it's also possible I'll just continue to revise and update the books every few years, when I've seen enough new courses that it makes sense … or, just put everything I see from here on out into a sixth volume someday. Q: You greatly expanded the South America portion of the book. Give us a sense how you went about choosing what you visited and any tips for the traveling golfer you feel are essential? TD: Being fluent in Spanish would make it WAY easier to travel around South America on your own. For those of us who chose French in junior high, it sure helps to know people. I leaned heavily on the expat architect Randy Thompson, who lives in Chile, and has done a lot of work in the region. He's probably the only guy who could have figured out how to get us across the Andes from the Lake District of Chile to the mountain courses in San Martin and Bariloche -- they won't let you take a rental car across, and there are no direct flights, so Randy got one of his clients to pick us up and bring us over. Another friend, based in Buenos Aires, took me to see the hidden gems there -- San Andres and the very private Ellerstina. You will rack up a lot of miles on a golf trip to Chile and Argentina, because the courses are few and far between. Luckily, airfares are pretty cheap within Argentina or Chile; the exchange rate is in our favor there. I also went to see the course at La Paz, Bolivia. It's one of the most fascinating places I've ever been, in a Wild West sort of way, and the course was actually quite good. [It was designed by Luther Koontz, who accompanied Dr. MacKenzie to Argentina to build The Jockey Club, and then stayed.] However, getting a visa to visit Bolivia [even for 36 hours] was ridiculously hard; I suppose it's payback to the U.S. for making it so hard for their citizens. Q: While I don’t want to impede on your annual Christmas newsletter project update, can you give us a quick overview of your various projects? TD: We finished two projects in Michigan this year -- the reversible course at Forest Dunes, which will open late next summer, and a project down near Kalamazoo at Gull Lake View, which my associates designed and built independently of me, at my suggestion. [The client didn't have a lot of money for design fees, and I was committed to focusing on Forest Dunes. So it's a great way for my associates can get more credit for what they do.] We've also had a lot of small construction work going on for consulting clients, everywhere from Garden City and Somerset Hills to Waialae and Royal Melbourne. Our new project for 2016 is in the Dominican Republic. Sadly, the land deal for the rumored project with Michael Jordan in Florida fell through, as I feared it would once word got out. But I did get to spend a couple of hours with Michael in January talking about golf course design, and that was fascinating. He's way more interested in it than you would think. Maybe someday the right piece of land will come along. Q: Most recent round of golf was where and how was it? TD: I played in a charity event at Ballyneal last week. I hadn't played there in four years; building courses in remote spots is very overrated, as far as opportunities to enjoy your own work are concerned. I was in a four-ball match against a friend and his father-in-law, who was getting too many strokes, and I had to shoot my best round there  just to get a half! I've seen 98 new courses this year, because of the book project, and played sixty rounds; it's the most golf I've played in ages. But it didn't really help my game much. I only broke 80 a couple of times. Q: Course you have not seen that you most want to play? For years, the answer to that was Banff and Jasper, but I played them both this summer in advance of Volume 3. Both exceeded my expectations. I also checked off places like Gamble Sands and Cabot Links this summer. I guess the current answer would be the new Cape Wickham course in Australia. Q: Most treasured item in your golf bag? TD: My putter, a Wilson knock-off of the George Low Wizard 600 that Nicklaus used for years. I've been playing with it since I was 13 years old. Once Crenshaw retires, I'll probably hold the record. Q: What’s the biggest change in golf/course design since the original Confidential Guide was published? TD: The idea that an architect needs to be out there building his courses, instead of just drawing them up. That was a fringe theory twenty years ago, only used by Pete Dye and a couple of his former students. Now it's gone mainstream. Q: This is an ambitious book given that the primary focus, Old Tom Morris, has been gone for some time. What got you interested in him and as the book’s title announces, the town? My first connection with Old Tom was watching David Joy perform his stage show as Old Tom in St Andrews. I was utterly gripped. I wanted to learn more and then read the novel Tommy’s Honour. The real eureka moment was reading Tom Morris of St Andrews, The Colossus of Golf. It really set a new benchmark for golf history books. The level of detail and presentation was phenomenal. Living in St Andrews, I began to see that there was very little of the town’s history on show. By that I mean you could walk around St Andrews and not realise that for example at the end of North Street lived the winners of 5 Opens and the sons of people who lived there, doors from each other, won a further 7 Opens and an Amateur Championship. It is a truly remarkable place and I wanted to share that un-told history. Q: Give us a sense how long it took to put the images together, the variety of sources and the issues faced? The book took about 3 years including writing, researching and tracking original photographs. There are so many people that helped including relations of the great golfing families and landowners in St Andrews. However the majority of the images came from the R&A, St Andrews Preservation Trust and the University of St Andrews. I was very fortunate to have a lot of good will and support from the get go. Some of my favourite images include the photo of Tom’s first shop taken circa 1850 and also unseen paintings, like the one of James Cheape, the man who saved the St Andrews golf course for evermore. The biggest issue was deciding what to leave out. Chic Harper, the designer, did a great job. My aim was to make golf history visual, beautiful and accessible and I think he captured the brief perfectly. Q: Am I correct that by putting all of these vital historic images of the town and golfers, especially Old Tom, that the images suggest they knew they were in a special place and documenting a special time? I think you are right in saying that they knew it was a special time. I say in the book that Old Tom was fortunate to be born at the right time and he truly was. Hugh Lyon Playfair had taken a filthy run down St Andrews in the 1830s, with the West Sands beach eroding the 1st hole, cow dung piled high on the streets and yet some 30 years later it is a renowned golfing metropolis. With Playfair’s vision coming into reality with Edinburgh’s New Town type housing, land reclamation down the first hole (by dumping rubbish on the beach and covering with soil…and that is why the 1st hole is flat), luxurious hotels and the railway line, St Andrews was re-born. It had been a successful and thriving place of pilgrimage but when the cathedral was felled after John Knox’s speech, the town slipped into decline for centuries. Tom was born as the town was beginning to blossom once more. He and Allan Robertson were golf’s first superstars. Allan was always considered the Champion Golfer. I like to think of them as brothers and not as employer and apprentice as most historians have noted them. They were only 6 years apart age wise. They were written about in the press and were acknowledged to be the best golfers in Scotland and thereby the world. In a harsh Victorian world, golf was kind to them and gave them a good living. It was Allan’s death aged 43 that led to the creation of The Open. Who is the new Champion Golfer? The era that followed was built largely upon the St Andrews dynamic. The evolution of photography and the growth of St Andrews happened at the same time and we are fortunate that so many images were taken to document that golden era. Q: If you had to list his most important contributions to the game, Old Tom’s greatest gifts to golf? Promoter? Architect? Clubmaker? Role in The Open? Tom was truly inspiring. If I had to rank his greatest gifts to golf in order, I would say golfer, architect and then promoter. As a golfer, he was the best in the world - a superstar of the Victorian age. He won The Open four times and crowds were never quite so boisterous as they were when Old Tom played Willie Park Sr. of Musselburgh. Thousands flocked to those grand matches. People tend to see Tom as the old guy with the beard. I think more about the 30 year old, who had no idea which direction his life would go, but hoping above everything to not have to work the weave or be a letter carrier like his father. As a golfer, he was human too – he had the yips and they plagued him until his later non-competitive years. Once when a letter was sent to the ‘misser of short putts’ at Prestwick, it found its way to him. People get quite sniffy about Old Tom as an architect of golf courses, but I would suggest that the list of the courses he set out is still a strong list of over 70 courses that includes, Muirfield, Prestwick, Carnoustie, Royal County Down and Cruden Bay. He effectively created the front 9 of the Old Course by clearing away lots of the whin to reveal the fairway we play on today. His 1st and 18th greens are still causing the pros trouble today. Finally as a promoter, Tom was a strong supporter of both ladies golf and generally spreading the game worldwide. When he created the Himalayas putting course for the ladies, this was frowned upon but nevertheless under the guidance of the R&A, Tom ploughed up the whin and created the popular putting green. It was said that clubmakers who traveled to the States with a letter of endorsement from Old Tom were sure to get a job. He was so revered in his own lifetime. To this list could be added many more contributions to golf including businessman, official starter, course maintenance, contributor to golf books/magazines, but I think as a player in his prime he was the the best of all. Q: What most surprised you in your research? I was absolutely delighted to find lots of images that have never been seen before. Some of the 19th century paintings are glorious and I am truly grateful to the families and organisations that allowed them to be seen in print for the first time. There was also a wealth of manuscripts that have really have not been looked at for many years - first hand accounts of St Andrews in the 1870s. It will take me a few years to do anything on the scale of Footsteps but there may be a few St Andrews books in the interim. The archives available to research in St Andrews are truly world class. Q: There are many other figures you include in the book, who intrigues you most from those vital years at St. Andrews? St Andrews popularity grew thanks to a unique combination of the golf course, R&A/Union Club, hotels, restaurants and the genuine beauty and history of the location. There are quite a few people who came together to create the St Andrews we know. However, I think that Playfair above all others absolutely fascinates me. How he managed to do what he did, when the locals were despondent at best about their run down town, is a truly wonderful achievement. He came back from India very wealthy (as did many…best not ask), having worked for the East India Company and used his money where needed to clean up the streets. Instead of ramshackle streets with porches and archways jutting out onto the pavement, he got them all removed. (This is where the name Principal’s Nose comes from as Playfair cut off the porch way that belonged to Principal Haldane of the University, who didn’t have a big nose, as is often told). The result was the clear clean lines of South, Market and North Street. Add to that the first golf club house in the Union Club, the R&A building, the saving of the 1st hole from the sea, the railway line and station and the town hall. The list goes on and on. He was a hugely important man who had more than a few folk standing in his way, but nevertheless succeeded. George Bruce who created the Bruce Embankment wrote scathingly about Playfair in Wrecks and Reminiscences and it is a fun read given how vitriolic Bruce can be. However, the results of Playfair’s sheer determination and work are still being enjoyed today. When we look to the success of St Andrews, Old Tom played a hugely important role and as mentioned was a Victorian superstar. He was undoubtedly a phenomenal golfing talent. One final example to illustrate this was that he shot a 79 on the St Andrews links. Over 30 years later, when the golfers were playing the easier routing with the new front 9 that we play today, Amateur Champion Willie Tait beat reigning Open Champion Willie Auchterlonie with an 86. They were still struggling to match his score. Old Tom Morris was simply outstanding by all accounts and that is why people continue to be fascinated by a man apart. Flash: New Book Reveals Augusta National Forces Media To Take Shuttles, The U.S. Open Is Hard & Bubba Is Complicated! 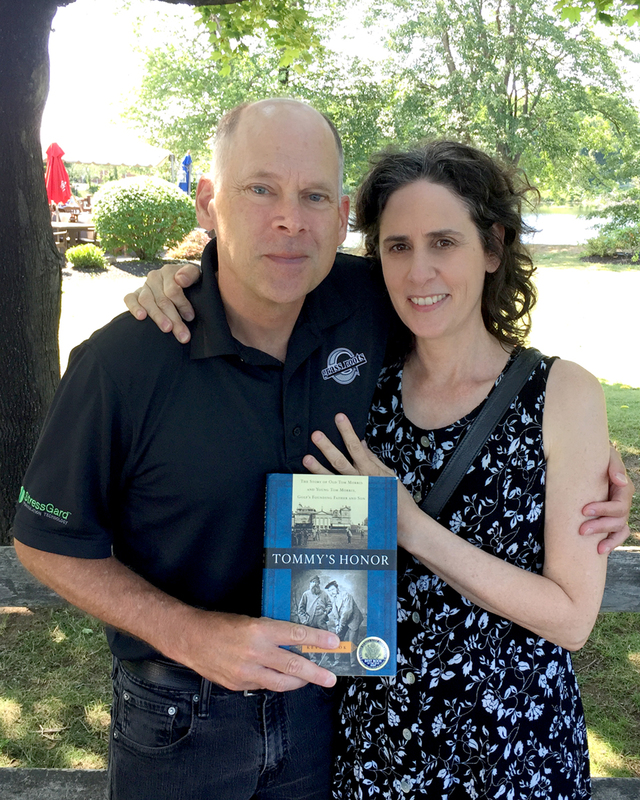 Congratulations to James Hansen, author of "A Difficult Par"